Finishing each other’s sentences is just one way the Lindquist boys—Ethan, 38, and Luke, 35—collaborate. As the winemaking team behind No Limit Wine, their new label with partner Cliff Korn, they’ve combined talents to produce extraordinary Northern Rhône-style wines. The brothers’ rough-and-tumble good looks, purple-stained hands, and suntans reveal their work-hard, play-hard lifestyle. This fun-loving attitude, coupled with their ultra-refined palates and thoughtful winemaking approach, makes them a dynamic cellar team—and in poker terms, two of a kind. 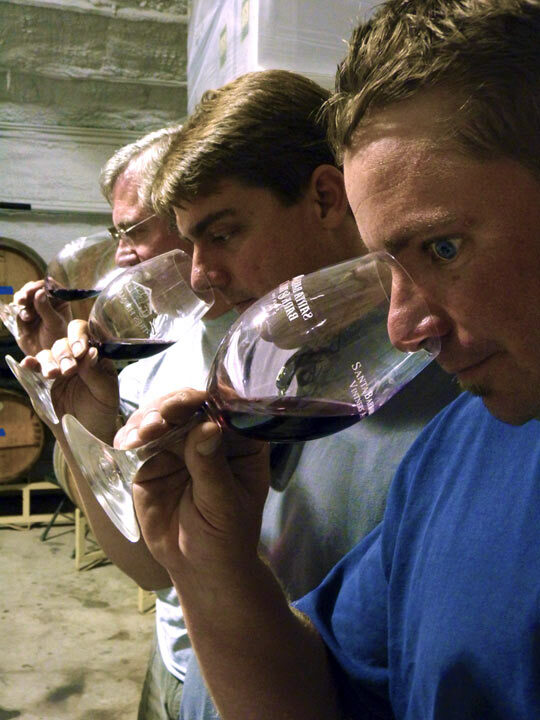 As the oldest children of esteemed Rhône Ranger and owner/winemaker of Qupé Wine Cellars, Bob Lindquist, Ethan and Luke grew up with Syrah in their veins. In fact, many of their fondest childhood moments have a Syrah-toned sheen. Some of Ethan’s earliest memories are of stomping grapes as a toddler and of working (Bob says “playing”) on Qupé’s bottling line at age 10. And it was over a glass of Qupé ‘94 Hillside Estate Syrah with his dad that Luke made his decision to be a winemaker. The boys were raised separately (Ethan grew up on the West Coast with their dad, while Luke lived with mom Susan MacDonald in Ohio), but they spent summers palling around in the Santa Ynez Valley, skateboarding, and surfing. “We’ve always been good buddies,” explains Ethan. And according to them, they’ve only had one serious argument—when Ethan called a foul during a one-on-one basketball game that Luke contested. “We’re guys. We got over it pretty quickly,” he says. These days the only place they compete is on the golf course, they explain—for dollar bets. 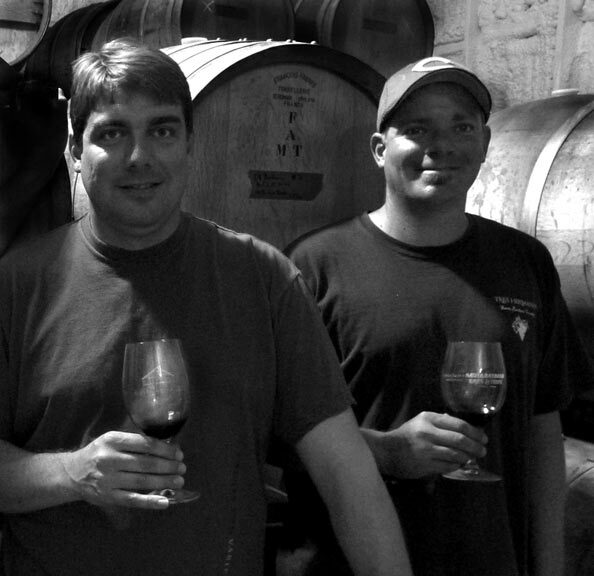 Both young men have achieved significant winemaking success on their own. Ethan began his namesake winery at 29 after studying in Santa Rosa and working at Tandem Winery for two vintages under Greg La Follette. Today he produces about 1,500 cases of Sangiovese, Syrah, Grenache, Viognier and Grenache blanc under his Ethan Wines label. Luke worked harvests in France (at Château Routas), New Zealand (Cloudy Bay), and Northern California (Davis Bynum and Milano wineries) before coming on as assistant winemaker at Brander Vineyards from 2003 to 2007. 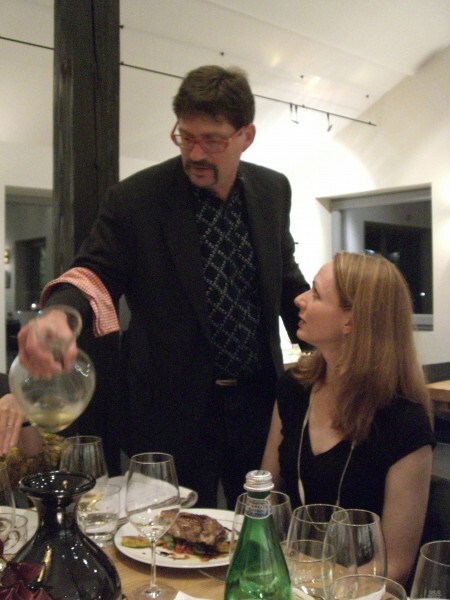 He is now the head winemaker for Tres Hermanas Winery where he oversees production of 2,500 to 3,000 cases of Sauvignon blanc, Malvasia bianca, Sangiovese, Barbera, Refosco, and Syrah. 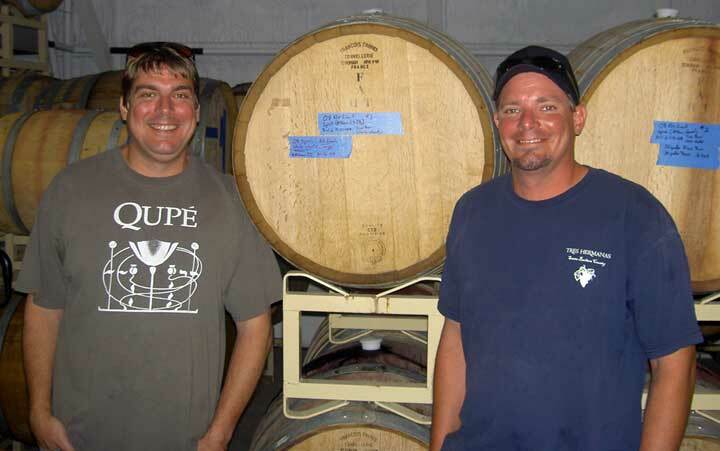 It was while working at Brander Vineyards that Luke first connected with Cliff Korn, Brander’s Director of Sales from 2005 to 2007. Korn, a New York City native, UCSB graduate, and poker aficionado was well-versed in the marketing aspects of the industry and had always wanted to get involved in the winemaking side of things. Though both moved on professionally—Cliff returned to New York to manage the wine merchant Acker Merrall & Condit—they kept in touch, and in July of 2008 began sourcing fruit for the No Limit label. 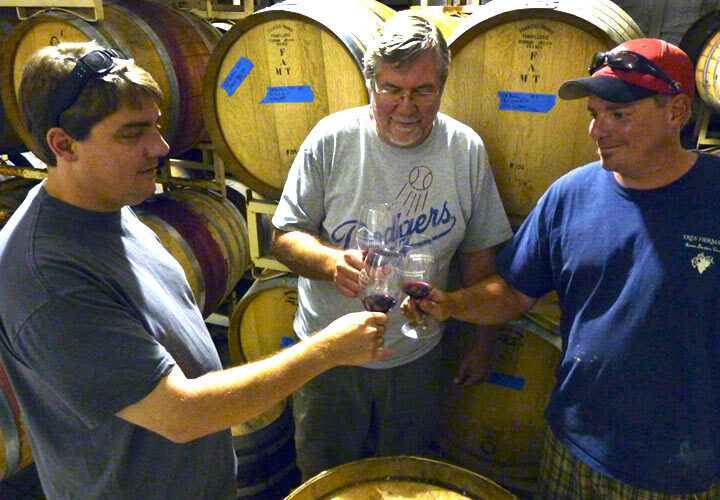 With the goal of making “serious wines for the not so serious,” the three gentlemen chose a collaborative approach. “We make a great team,” offers Cliff. “We each have insight and experience to contribute,” he says referring to Ethan’s brand management expertise, Luke’s international production experience, and his own business and wine retail know-how. No Limit, the label’s poker-themed name, refers to the game’s unlimited betting structure and is intended to highlight the balance of strategy and skill required to both win a hand and craft quality wines. “Winemaking, like poker, is all about calculated risk,” says Ethan, referring to financial aspects as well as the critical decisions that must be made throughout the juice-to-wine transformation. “And of course, working with Mother Nature is always a bit of a gamble,” adds Luke. The trio shares a similar winemaking philosophy and is passionate about creating balanced, lower-alcohol, Northern Rhône-style Syrahs that communicate elegance and a sense of place. To accomplish this, they employ old-world production methods: foot stomping, manual punch-downs, wild yeast fermentations, and cold soaking to let the fruit express itself. No Limit’s two 2008 Syrahs will be released this fall. 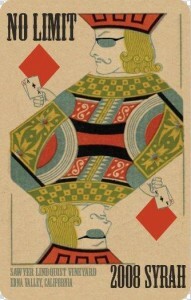 The label’s top-tier wine, “The Nutz,” (a name that refers to an unbeatable hand in poker) is deliciously complex and age-worthy. Made with 100 percent whole-cluster syrah, the wine’s texture stands out amid the swirls of earth, green peppercorn, leather, and elegantly balanced fruit. The “All In,” a fruit-forward Syrah (whose name refers to when a player bets all his chips) is made with a variety of syrah clones and aged in 20% new oak barrels. The wine’s lush cherry fruit, balanced by tobacco, cigar box, and peppery spice, makes it dynamic and approachable. 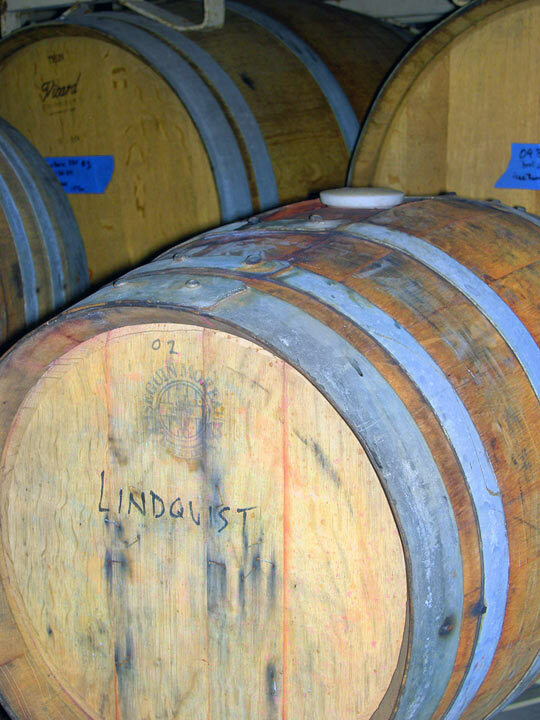 And indeed, with high quality fruit and thoughtful hand crafting, Cliff Korn and the Lindquist brothers have not only upped the ante with No Limit wines, they’ve presented a royal flush. Wine writer Laura Sanchez spent much of her childhood climbing avocado trees on her family’s California ranch. She graduated from Cate School, studied Spanish literature at Middlebury College, and first tasted terroir while working as a sous chef on the Spanish island of Mallorca. Laura is passionate about wine and food and has worked in the publishing industry since 2003 as a writer and editor of both print and online media. She is the former managing editor of Destination Wine Country Magazine and currently covers the Central Coast wine scene for the Santa Barbara Independent. She also contributes wine editorial to Edible Santa Barbara, and From the Vine. I love Qupe and The Rhone-Rangers of CA. Relatively undiscovered wine producing area in CA, not well known to the general public-Unfortunate!